Hawaii has long been a favorite destination for Scuba Diving, with its tropical climate, year round diving in warm, clear water and with the abundance of marine life that dwell in the colorful coral reefs, diving here is appealing to everyone. Pelagic shark dives are different in that all you need is snorkel equipment and you will be snorkeling at the surface of ocean water of deeper depths, where the pelagic sea life dwell. 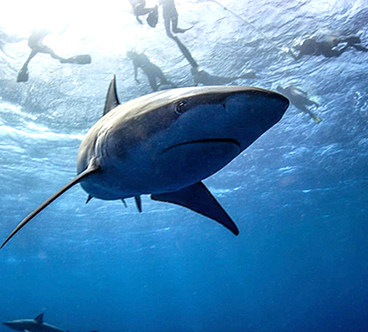 On a shark snorkeling dive you are likely to encounter sharks, whales during the whale season, dolphin, barracuda, mahi mahi, tuna or any other type of marine life typically known to be “pelagic”. This is an underwater photographer’s dream and an item on any adventure seeker’s bucket list! Education is an extremely important part of our dive, that’s why you will be accompanied by a Divemaster, Scuba Instructor and a Certified Underwater Naturalist. These highly trained and seasoned professionals are experts in marine life identification and behavior, they will teach you how to safely and comfortably interact with the pelagic sea life, and will also explain conservation efforts in effect and legislation passed to help protect endangered species. You will come away with so much more than just bragging rights to say “I dove with the sharks or whales”! You will gain knowledge about all kinds of marine life, in-water experience, and some amazing photos and videos of your Hawaii Adventure Diving Shark Dive too! Starting at the dock when you board the dive boat and during the 3 mile trip out to dive site you will be briefed on what to expect from your dive beginning with a safety briefing from your Captain. Your Divemaster will give you a demonstration of the equipment and will further explain with visual aides, photos and graphics about the nature and identification of the sea life and answer any questions that you may have. Once at the dive site, the Divemaster will enter the water first, then will call the divers into the water via the dive boat’s ladder after an evaluation of the site. This is where the real fun begins! Whether you’re using a hand held GoPro on a stick, a $150,000 professional underwater setup like our friend, Emmy Award winning “Andy Brandy Casagrande” who Hawaii Adventure Diving had the honor of working with on Discovery Channel Shark Week 2014, or even a $20 disposal underwater camera, you may just get the shot of your lifetime! GET THE SHOT! 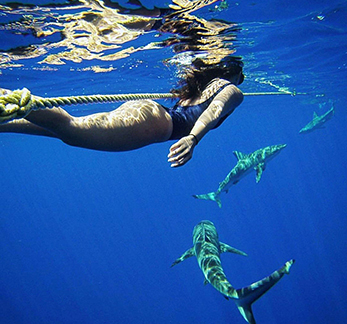 But what’s it REALLY like to snorkel in the open ocean with SHARKS?! Well, the thing we hear the most from people is “THAT was the BEST thing I’ve EVER done!”. At first you may feel an adrenaline rush, this is normal, but once in the water for just a few moments you’ll be absorbed by the calm, quiet deep blue water. You might feel like “one of them”… as accepting of the sharks as they are of you. As you check them out they are curious about you too and will often make direct eye contact with you and your camera! Our tours are intimate, with a maximum of only six divers per tour. You should feel very calm, confident and in awe of the beauty of the wild animals that you swim freely with! We ask that you please DO NOT touch the sharks or try to hitch a ride on their dorsal fin. We firmly believe in showing the utmost respect to these majestic creatures of the sea, as they so deserve! This couple, “Kori & John”, took their very first Open Water Pelagic Shark Dive with us & you can see in the video above how quickly they relaxed & enjoyed their experience! You’ll probably climb out of the water & onto the dive boat swim platform with the biggest grin of your life! You’ll re-live every minute of your dive adventure with your dive buddies & check out your photos, anxious to upload to Instagram & Facebook! But remember we have a 3 mile return trip to the Haleiwa Harbor & if you’re diving with us during whale season thats another opportunity for some great Humpback Whale photos! Sea birds, dolphins, sea turtles, not to mention the picture postcard scenic beauty of the North Shore coastline and mountain range, there’s still so much more to take in! Be sure to check out our Hawaiian Sealife page for some beautiful pics taken from both in the water & top-side from the dive boat! Feel free to post your own dive pics to our Facebook page “HAWAII ADVENTURE DIVING” & please tag us on your Instagram too, @hawaiiadventurediving!